Above: Overview of the site. Detail from the panel: Figure on the left has a skeleton-like quality, almost like an "x-ray" depiction of internal organs. 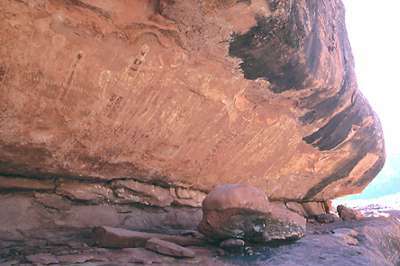 In the middle is an odd three-headed anthropomorph (the three-headed figure is a motif repeated at other Grand Canyon sites). The life-sized figure on the right has been superimposed over an early set of outstretched arms; there are two small red anthropomorphs on the shoulder of this large figure. Detail from the panel: Elements are crowded and often superimposed. 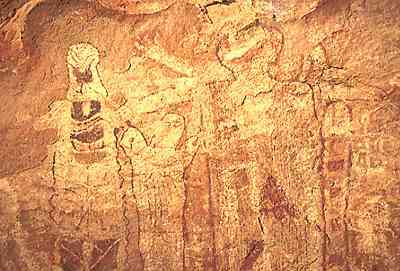 Bright white pigment may have been added at a later date, perhaps in Anasazi times. 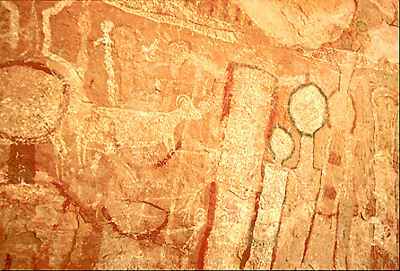 (The main paintings are thought to be of Archaic origin).